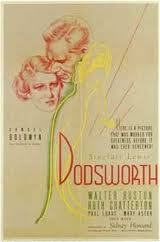 “Dodsworth” is a gem from 1936, directed by William Wyler, based on a subtle little Sinclair Lewis novel. Walter Huston is Sam Dodsworth, head of an automobile-manufacturing firm in Ohio, who’s retiring so that he can enjoy the Good Life in Europe. Ruth Chatterton is his silly shallow younger wife, who’s fairly drooling to get to Europe so that she can misbehave (and she does). Sam adores his silly young wife, even while she cheats on him with a variety of men: English, French, Austrian. Finally Sam and his wife part ways. Do you think Sam will find the nice lady in Italy whom he met on the boat? Mary Astor wrote about it in her wonderful autobiography, “A Life on Film.” She especially remembered creating the scene in which she sees Sam Dodsworth coming to her from the steamship in the Naples harbor. She recreates it for us: the chalk marks on the scenery, and the silly stuff (an ashcan labeled PUT YOUR BUTTS IN HERE that was in her eyeline). And she imagined herself the heroine, and waved to an imaginary man in a boat in the harbor, and made herself believe that it was real. See “Dodsworth,” kids. It is sheer joy.